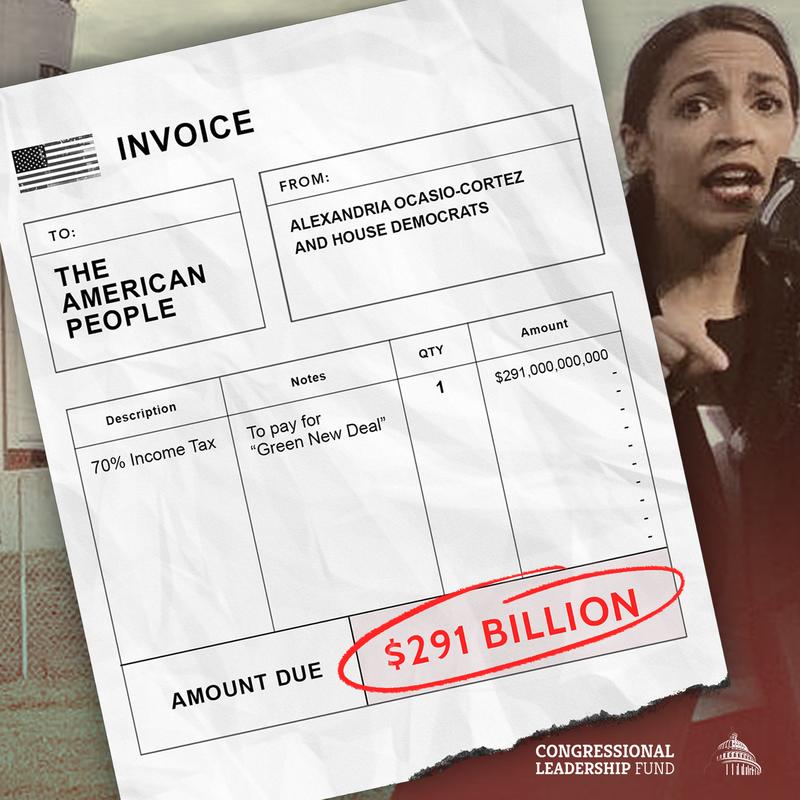 Today is Tax Day, a day when Americans of all stripes are confronted by just how much of their hard-earned paycheck is confiscated by the federal government. But for House Democrats and their clown car of socialist leaders, it’s a day that serves as a great reminder of how much more Democrats would have families pay under their hardline progressive agenda. To ‘celebrate,’ the Congressional Leadership Fund will be sharing tax invoices (like the below) for the craziest of their ideas all day long to remind the American people what’s at stake this November. 1) Alexandria Ocasio-Cortez’s plan to raise income taxes as high as 70%. 2) Bernie Sanders’s plan to raise taxes $16.2 trillion in order to kick 180 million Americans off their health care. 4) Elizabeth Warren’s newly proposed $1 trillion tax hike on American businesses through her 7% “corporate profits” tax. 5) Bernie Sanders’ 77% death tax. 7) Ron Wyden’s “breathtakingly terrible” idea to raise taxes on Americans’ investments, savings and the value of their small businesses. 8) Democrats’ vote earlier this year to change the House rules to make it easier for them to raise taxes. 9) Nancy Pelosi’s plan to repeal the GOP tax cuts which would leave as many as 90% of Americans facing higher taxes. NOTE: A similar, targeted version of this release also went out in the districts of Collin Peterson, Anthony Brindisi, Jared Golden, Matt Cartwright, Antonio Delgado, Ben McAdams, Andy Kim, Haley Stevens, Lauren Underwood, Abby Finkenauer, Elaine Luria and Abigail Spanberger.